Though based off the dynamic Nissan Altima Sedan, the sporty, 2-door Altima Coupe delivers a totally unique driving experience. The Altima Coupe fills a desire among target customers for a more personal expression of style, individuality and fashionable appearance. Its unique exterior design is intended to stand out in a crowd of sedan-based two-door models with magnetic, perfectly proportioned styling with a shorter wheelbase, shorter overall length and lower height than the Altima Sedan. 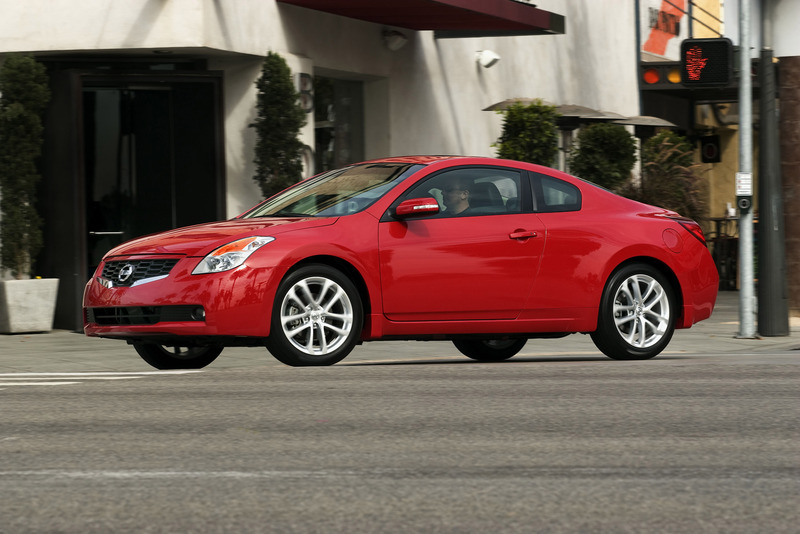 The smaller size and lighter overall weight also contribute to the Altima Coupe's sportier driving feel – another desired attribute of the typically younger, more performance-oriented coupe buyers. "Like the popular Altima Sedan, the Coupe offers style, performance, quality and passion with a personality that is all its own," said Al Castignetti, vice president and general manager, Nissan Division. "The Altima Coupe is more than just two less doors, it offers its own unique interpretation of Nissan's exhilarating driving pleasure. The Coupe's aggressive design, driver-oriented cockpit and unique styling give it an extensive amount of separation from the Sedan." 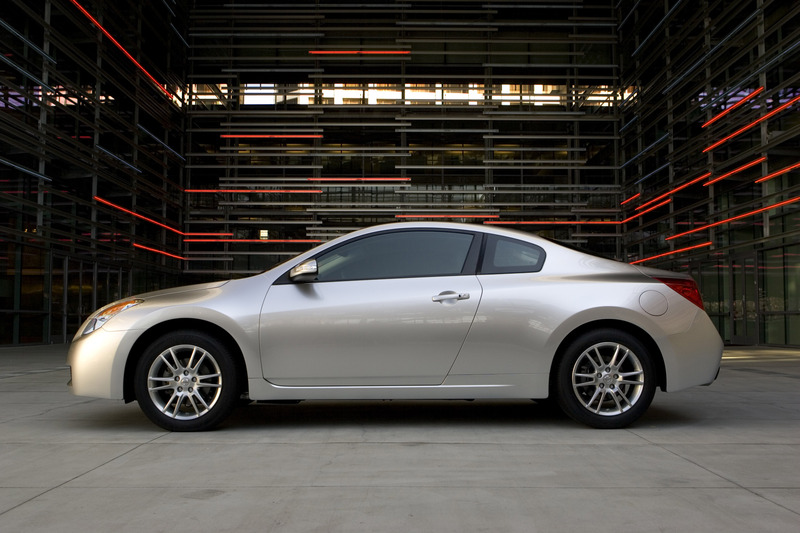 An all-new design for 2008, the Altima Coupe adds revised 18-inch alloy wheels on V6-equipped models with larger 235/45R18 tires for the 2009 model year. Automatic door locks are also added to all models and the front grille receives a high-gloss paint treatment (previously medium gloss). 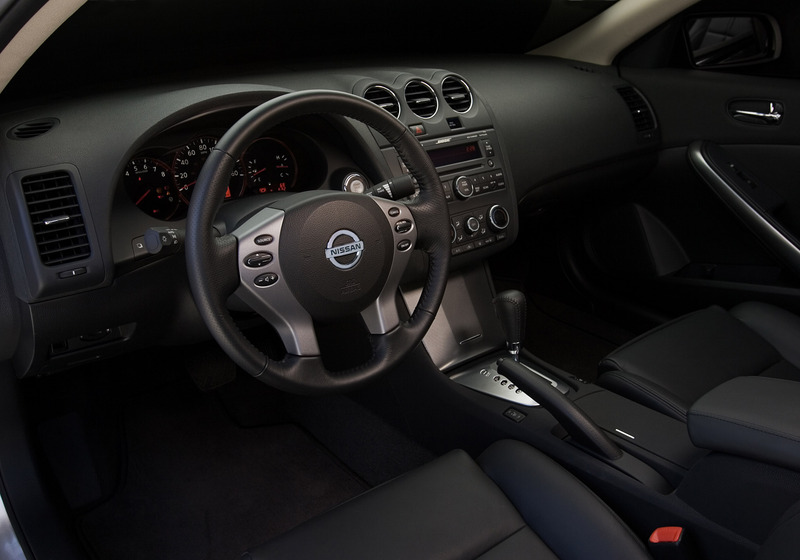 The 2009 Altima Coupe is available with a choice of the award-winning VQ-series 3.5-liter V6 or powerful 2.5-liter inline 4-cylinder engines, each offered with either a 6-speed manual transmission or Nissan's advanced Xtronic CVT™ (Continuously Variable Transmission). Also offered for 2009 is a long list of user-friendly technology features – including standard Nissan Intelligent Key®, available Bluetooth® Hands-free Phone System, an advanced touch-screen navigation system with XM NavTraffic® with real-time traffic information (XM® subscription required, sold separately) and RearView Monitor. 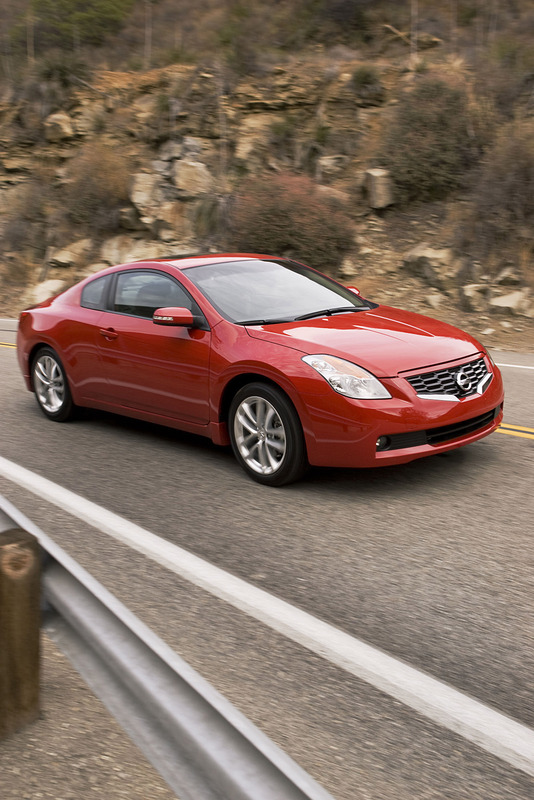 The most noticeable separation from the Altima Sedan is the Altima Coupe's bold exterior styling. 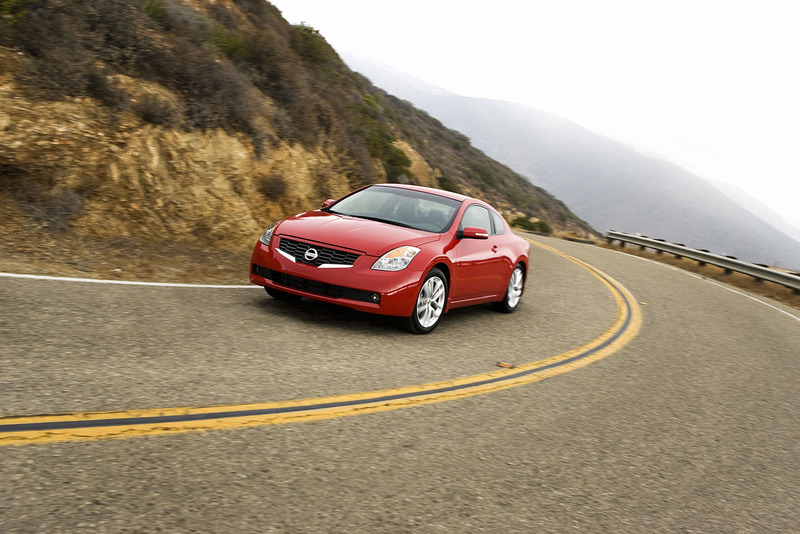 Dimensionally, the Altima Coupe rides on a 105.3-inch wheelbase, a full 4.0 inches shorter than the Sedan. Overall length is 182.5 inches – 7.1 inches less than the Sedan. The Coupe also has a lower profile – at 55.3 inches it is 2.5 inches lower than the Sedan. In terms of major body panels, the two cars share only a common hood, with all other panels, grille, headlights and rear combination lights unique to the Altima Coupe. Two chrome exhaust tips with unique rear taillights form a distinctive rear presence. "Altima Coupe is sleek and sporty, featuring an aggressive stance and a bold shoulder that adds dimension to the body side," said Castignetti. "It's a car that looks much more expensive than it is, both the exterior and interior, and feels like it, too." 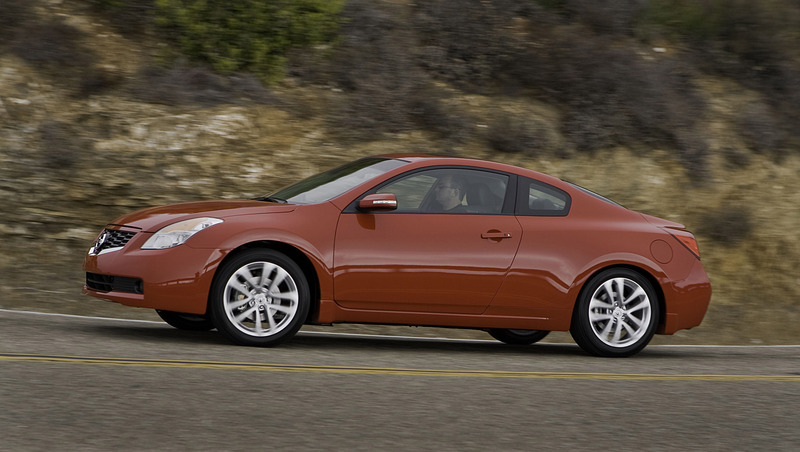 The 2009 Altima Coupe 2.5 S model is available with 16-inch aluminum-alloy wheels on the 2.5S model with P215/60R16 all-season tires, while new 18-inch aluminum-alloy wheels with Michelin P235/45R18 tires are standard on the 3.5 SE. Under the Altima Coupe's sophisticated exterior design, this latest addition to the Altima family shares the platform, powertrain and user-friendly features and innovations of the fourth-generation Altima Sedan. 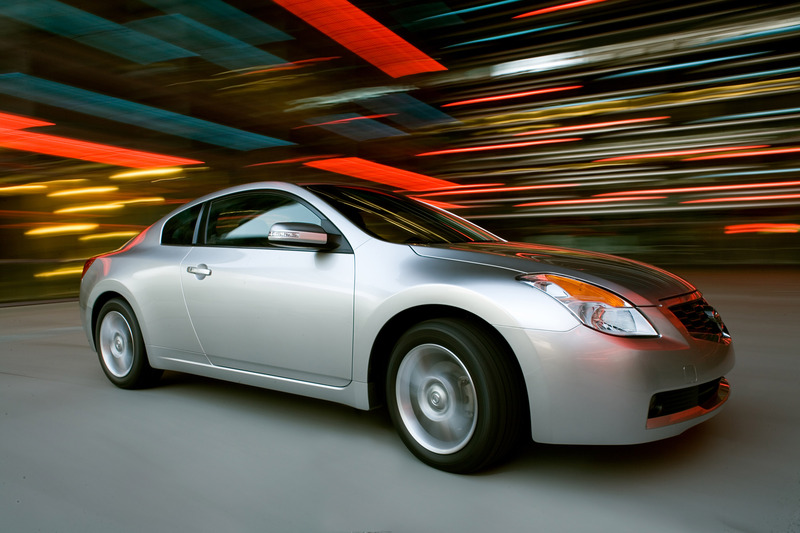 Altima Coupe utilizes Nissan's advanced "D" platform. 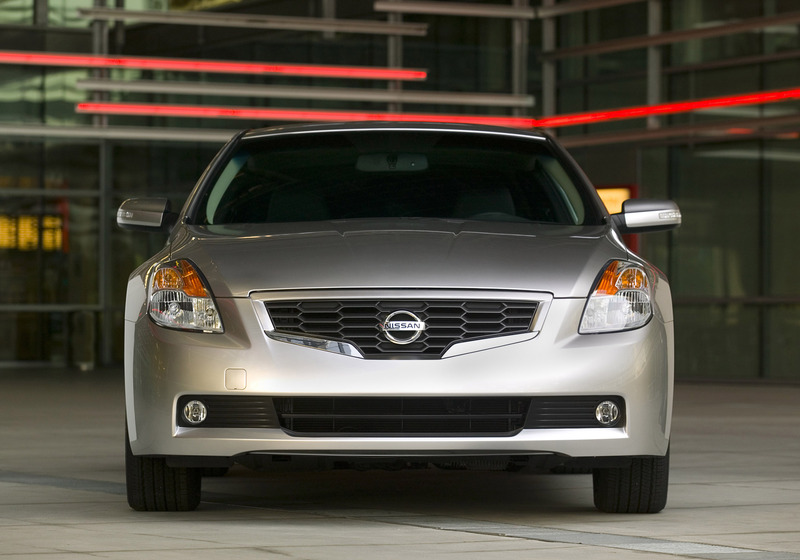 First used on the 2007 Altima family, this new platform was developed with the objective of making Altima one of the best performing large front-wheel drive vehicles available globally. 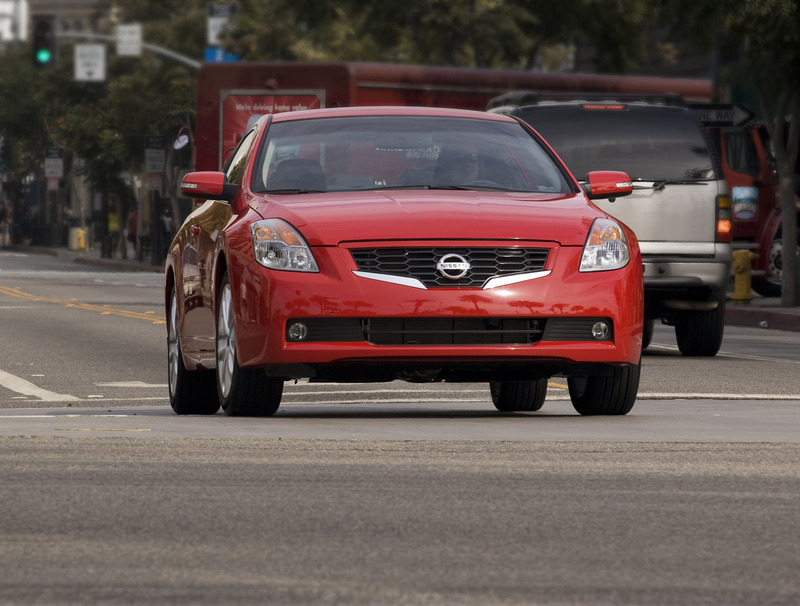 A number of items help to virtually eliminate torque steer on the Altima Coupe, including suspension geometry, an engine placement that is lower in the subframe and equal-length half-shafts that have equal angles and are more parallel to the ground (than the previous platform design). The Coupe's rear multi-link independent suspension design separates the rear shocks and springs for reduced friction and the shocks are in line with the center of the rear wheels, providing better damping and less harshness. Front and rear stabilizer bars are standard. 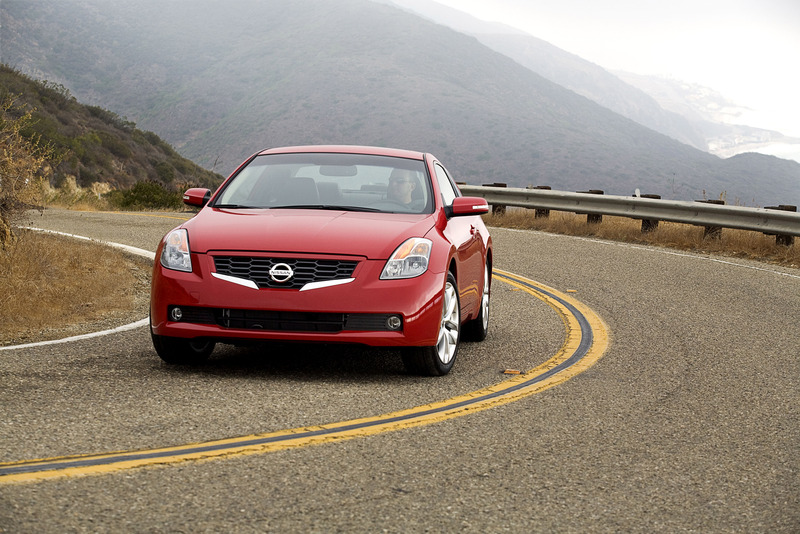 The Altima suspension has been specially tuned for use with the Altima Coupe. Eye-opening power is supplied from a choice of two engines and two transmissions. The 3.5-liter 24-valve DOHC V6 is the "next generation" version of the 13-time Ward's "10 Best Engines" award-winning VQ-series V6. For use in the Altima Coupe, it is rated at 270 horsepower and 258 lb-ft of torque and offers strong acceleration and refined sound quality. The V6 features reduced friction, improved cylinder head cooling and twin knock sensors. Also available with the Coupe is a 2.5-liter DOHC 16-valve QR25 inline 4-cylinder, producing 175 horsepower (170 hp CAL) and 180 lb-ft of torque (175 lb-ft CAL). This engine has been refined from the previous version, with a larger, equal-length intake manifold, increased compression ratio and reduced friction characteristics. It features a silent chain drive and a balancer system (with balancer changed to a center-mounted location for better NVH) that effectively negates vibrations without taking up much space – combining ideal packaging and smoothness. Both engines feature continuously variable valve timing, modular engine design, microfinished crank journals and cam lobes, molybdenum coated lightweight pistons and electronically controlled throttles. Both the 3.5-liter V6 and 2.5-liter 4-cylinder models are available with Nissan's advanced Xtronic CVT™ (Continuously Variable Transmission) or 6-speed manual transmissions. The V6 CVT features a "Sport" mode controller with a high-speed central processing unit and Adaptive Shift Controller with adaptive logic for faster shifting in both normal and manual modes. The adaptive logic feature delivers the best shift pattern based on the driving environment and driver's perceived intentions. "The driving performance of the Altima Coupe is biased toward sporty feel, especially when equipped with our award-winning V6," said Castignetti. "Handling is also a strong point of the Coupe, as is the responsiveness feeling provided by the Xtronic CVT transmission." Also contributing to the Altima Coupe's sporty performance feel are a standard twin-orifice vehicle-speed-sensitive power rack-and-pinion steering system and 4-wheel disc brakes with standard 4-wheel, 4-channel, 4-sensor Anti-lock Braking System (ABS) with Electronic Brake force Distribution (EBD). 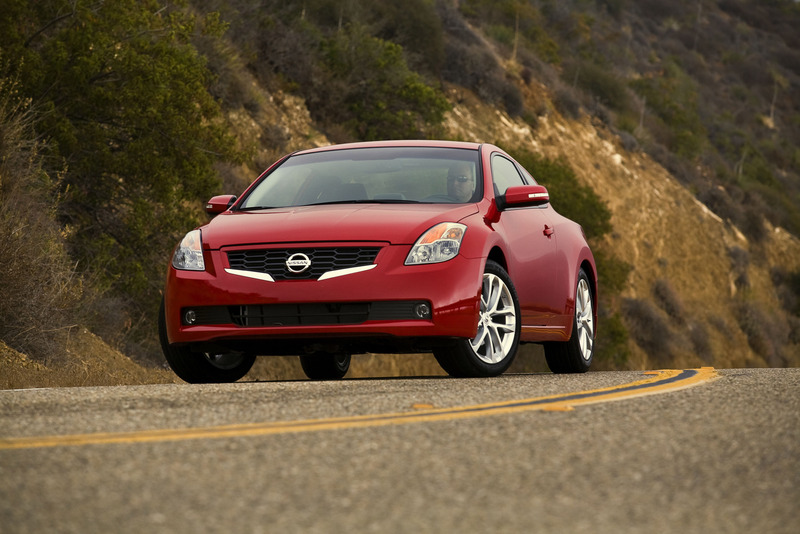 Inside, the Altima Coupe is exciting and accommodating with progressive, driver-oriented styling. Though sharing much of the design and features with the Altima Sedan, the Coupe includes unique sport-style front seats with more side support, in-board release lever and front kangaroo pouches. All Altima Coupes also utilize a parking brake hand lever (versus foot release for Altima Sedans with CVT). The Coupe also includes a 60/40 split and flat fold-down rear seat. 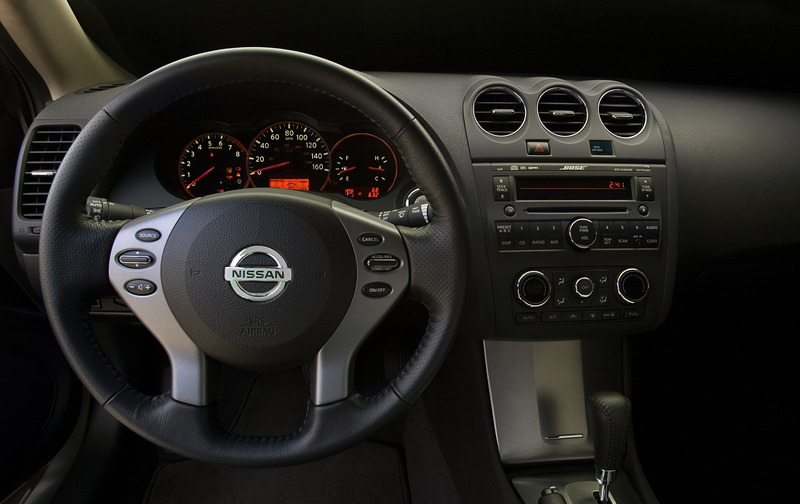 Like the Altima Sedan, the Altima Coupe's instrument panel features a Fine Vision gauge display for enhanced readability and the L-shaped flow of the instrument panel to the center console adds to the driver-oriented cockpit feel. The center console includes a double front cup holder, among the many convenient cup and bottle areas and storage compartments. The list of passenger amenities includes standard Nissan Intelligent Key® with Push Button Ignition and available Bose®-developed audio system with nine speakers, Bluetooth® Hands-free Phone System, XM® Satellite Radio (XM® subscription required, sold separately), RearView Monitor and dual-zone automatic temperature control. The 2009 Altima Coupe also comes equipped with a number of standard safety features, including Nissan Advanced Air Bag System (AABS) with dual-stage supplemental front air bags with seat belt and occupant classification sensors, front seat-mounted side impact supplemental air bags and roof-mounted curtain side impact supplemental air bags for front and rear-seat outboard occupant head protection. Other standard equipment includes front seat belts with pretensioners and load limiters, front seat Active Head Restraints, the LATCH System (Lower Anchors and Tethers for CHildren), Zone Body construction with front and rear crumple zones and Tire Pressure Monitoring System (TPMS). 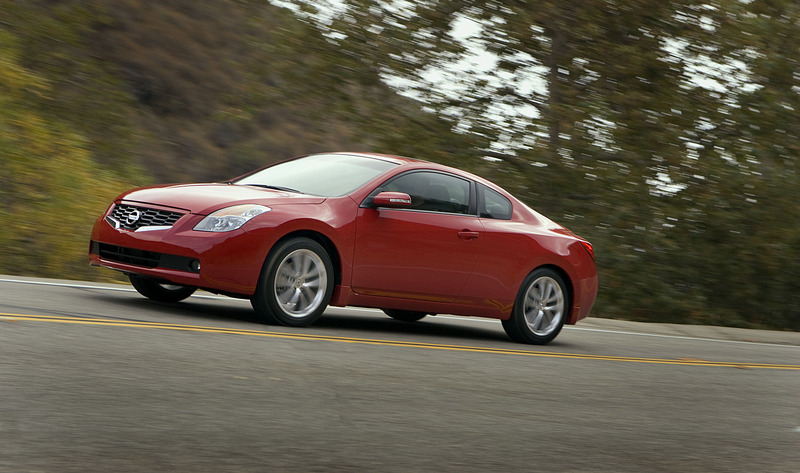 The 2009 Altima Coupe is available in four well-equipped models: 2.5 S 6MT, 2.5 S CVT, 3.5 SE 6MT, 3.5 SE CVT. Available equipment packages include the Convenience Package ((2.5 S) with 16-inch aluminum-alloy wheels, 8-way power driver's seat with manual lumbar adjustment, auto on/off headlights, leather-wrapped steering wheel, wood grain trim finishers for Blonde interior and more; and the 2.5 S Premium Package(2.5 S) withthe contents of the Convenience Package plus leather-appointed seats, heated front seats, Bose® 9-speaker audio system, dual-zone automatic temperature control, HomeLink® Universal Transceiver, power sliding glass moonroof, premium interior finishers (wood grain for Blonde, metallic for Charcoal), Bluetooth® Hands-free Phone System and more. The optional 3.5 SE Premium Package adds to the well-equipped 3.5 SE model with leather-appointed seats, High Intensity Discharge (HID) Xenon headlights, heated front seats; Bose® 9-speaker audio system, HomeLink® Universal Transceiver, premium interior finishers (wood for Blonde, metallic for Charcoal); Bluetooth® Hands-free Phone System and more. Also available are a Technology Package with Nissan navigation System and RearView Monitor; a Moonroof Package; and fog lights for the 2.5 S (both standard on the 3.5 S). "Along with the Altima Coupe's extensive list of available features and amenities, it offers one more thing to discerning coupe buyers – the reassurance of Nissan durability, quality and reliability," said Castignetti. 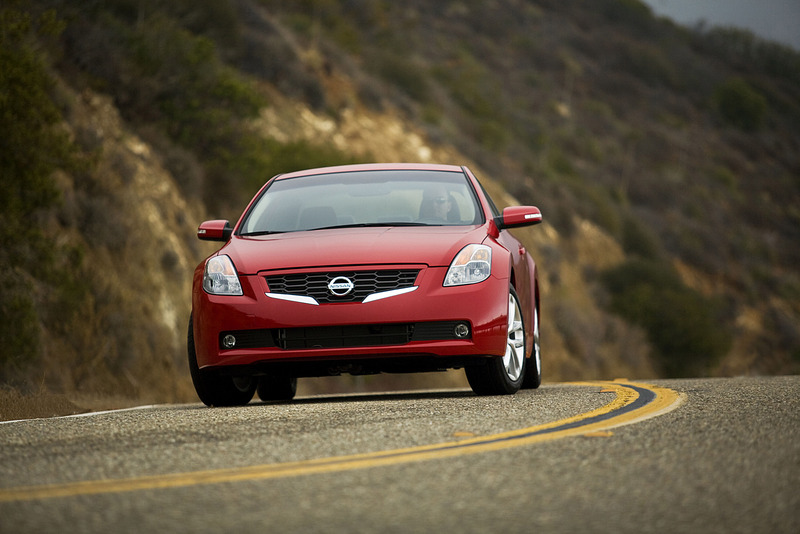 The 2009 Altima Coupe is assembled at the Nissan North America – Smyrna and Decherd, Tennessee Manufacturing.